- Very simply to use, just pop it up; then fold it back down to store. - It comes with a carrying bag, very easy for compact storage and transport. - All material non-toxic, odorless, According to international standards base. - Apart from Adults, kids would be safe to use. - Tent with a nail and fixing holes, under windy conditions in outdoors, tents can be fixed. - Larger space, can hold 4 peoples, stable structure, suitable for beach, lake, parks and other places. - Function: Sun shade and UV Protective. UV50+ High Sun Protection - It's anti-uv sun shelter, designed by special material of galvanized iron and fabrics get you free from exposing to the sunshine. 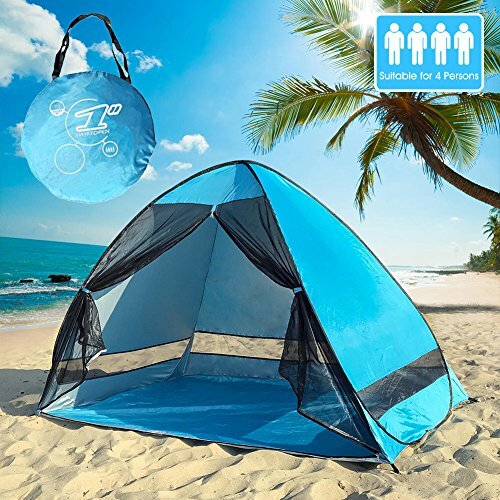 1 Second Pop up Design - Innovative pop up tent, no assembly required, patented structure with automatically pops up and down. Strong Structure & Easy to Carry - With strong steel beam frame, waterproof and very durable. When fold back down into the carrying bag, the diameter is 22.4in (57cm), lightweight and easy to carry. If you have any questions about this product by Betty, contact us by completing and submitting the form below. If you are looking for a specif part number, please include it with your message.